Perhaps there are no parents who haven’t heard the words of begging for a pet from their beloved offsprings. Some of parents simply turn their backs on these continuous moaning and groaning, whereas others fall prey to their child’s intense desire to have somebody to take care of. 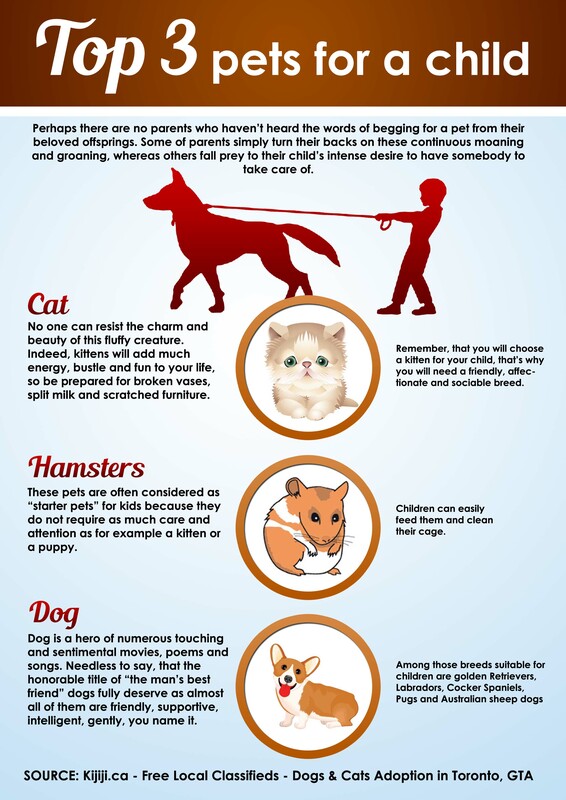 If you belong to the latter category, it is worth as least being aware of the most widespread pets, their advantages and disadvantages to be able to choose from. Perhaps the most common pet all the parents oft for, is a cat. Of course, no one can resist the charm and beauty of this fluffy creature. Indeed, kittens will add much energy, bustle and fun to your life, so be prepared for broken vases, split milk and scratched furniture. Remember, that you will choose a kitten for your child, that’s why you will need a friendly, affectionate and sociable breed. Birman, Burmese and Abyssinian, American shorthair (gets on well with dogs) are the best bet. Although cats are believed to be independent and require less attention than dogs, it doesn’t mean that they do not need commitment. Keep in mind, that you will not avoid regular veterinary checkups in order to keep both your child and his or her pet healthy and happy. In case you are not so choosy about the expensive breeds, you might check your local cat adoption to pick up a kitten from. These pets are often considered as “starter pets” for kids because they do not require as much care and attention as for example a kitten or a puppy. Children can easily feed them and clean their сage. Hamsters need a clean “home” and a lot of things to chew to wear down his incisors. In a pet store it is possible to purchase plenty of hamster supplies. For a start, it is worth choosing Syrian hamsters because they are larger than other hamster breeds and are easier to tame. These pets are very entertaining to observe and your child will find out a lot of interesting things from the world of animals just watching his favourite hammy to look after himself. There are, however, some things to consider. First of all, hamsters are most active and lively at night, which can be very annoying and of course, it’s no good to keep a cage in a room with a child who wakes up easily. Secondly, if you have decided to have two hamsters not to let them die of boredom, be ready to deal with four to five litters a year between four and ten babies each. They might be rather difficult to get rid of unless you are a hamster breeder. The most classic children’s pet ever, a dog is a hero of numerous touching and sentimental movies, poems and songs. Needless to say, that the honorable title of “the man’s best friend” dogs fully deserve as almost all of them are friendly, supportive, intelligent, gently, you name it. Among those breeds suitable for children are golden Retrievers, Labradors, Cocker Spaniels, Pugs and Australian sheep dogs. All these dogs are characterized by their gentle demeanor, friendly temperament, confidence and cheerfulness. Remember, that there are some breeds you should steer clear of, for example Bull Terriers, boxers are quick tempered and never compromise. In addition, you should remember that breeds are forbidden to choose if you are considering Kijiji options to adopt a dog because you don’t know what the previous master could teach this dog to do.